Kimberley Toad Busters founder Lee Scott-Virtue and Dean Goodgame will be talking about quarantine issues prohibiting scientific research into biological control; their win at the Regional Achievement & Community Awards on the weekend and the latest updates from the on-ground campaign in the Northern Territory and Kununurra. 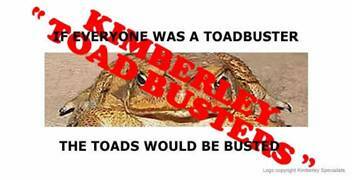 Archaeologist, researcher and founder of the Kimberley Toad Busters, Lee Scott-Virtue says they have had specimens of toads presenting invaluable keys for research into a biological control but lack permission to bring them over the border. They are dead and pose no breeding risk. The Kimberley Toad Busters won the Community of the Year Award category for the National Regional Achievement & Community Awards last Friday. The Kimberley Toad Busters have galvanised the Kununurra community with 25% of its population volunteering their time and resources to the group. Since their toad busting efforts began sixteen months ago the group have busted over seven cubic tonnes of toads as well as millions of eggs, tadpoles and toadletts. This is the first campaign where Aboriginal and non-Aboriginal groups have worked together in a campaign which had a federal boost to its personal funding earlier this year. The group are also finalists in the WA Environment Awards 2006 on Friday in the Community Achievement – Community/Volunteer Group category.